Defensive backs coach Travis Fisher keeps a production chart. Tackles get you points, forced fumbles get you points, picks definitely get you points, dropped picks lose you points. It’s a pretty simple way, really, to show his guys where they stand in his room. There is currently a freshman atop that chart. With two interceptions on the first day of camp, cornerback Cam Taylor has come out guns blazing. The converted high school quarterback doesn’t look it. About the level of play Taylor brings to the position, Lamar Jackson agrees. But when it comes to Taylor's mindset, Jackson says the quarterback history helps. “[It] shows in his character," Jackson said. "He’s a ‘yes sir, no sir’ guy. He’s a natural leader. You can see that he was a quarterback back in the day. As a corner, he’s growing and getting confident. Even if he makes mistakes he makes them fast. He’s doing his thing." Athletically, Taylor is exactly what you want. He’s 6 feet, 205 with power and speed. He looks the part of a Big Ten cornerback. But the success can probably also be attributed to a crazy work ethic since arriving on campus in the summer. Everyone that talks about him singles out one thing: his willingness to learn. 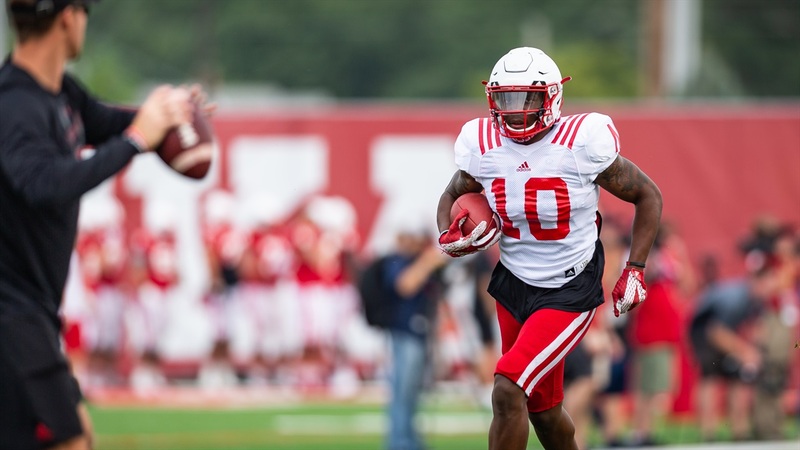 At Big Ten Media Days in Chicago, wideout Stanley Morgan Jr. said the freshman corner always has a question for him and always takes the answer to heart. Jackson says the same. Taylor went to corner Dicaprio Bootle when he arrived in Lincoln and asked for as much guidance as he could get. The way he plays on the field and the way he carries himself off it would lead you to believe he’s older than he is. Or, at the least, that’s he’s been in the Husker program for more than just a few months. Exactly the mentality coaches have been looking for throughout the whole team. The staff hasn’t been shy about publicly pushing the defense, especially the secondary. Against the pass last season, the defense was 122nd in the country in success rate and the defensive backs alone were dead last in havoc rate. If the defense is to improve this season, it needs better play from its secondary and that starts with being able to make more plays on the ball. So far, things are going smoothly in that regard. Taylor seems to be leading the charge for a defense that has been as-scripted through the first week of fall camp. Chinander’s style is aggressive and opportunistic (the exact opposite of last year’s approach) and the newest additions to the team are pushing the rest of the unit in a way that has coaches pretty pleased. It’s possible Taylor might not start on Day 1, but it’s highly unlikely he won’t play a significant role if he continues on the trajectory he’s on now. Alongside Taylor, the Huskers have, since the spring, added junior college transfer Will Jackson and freshmen C.J. Smith and Braxton Clark. That’s just at corner; the Huskers still have Jackson, Bootle, Eric Lee Jr. and Ethan Cox contending for snaps. “I’ve seen those [new] guys make plays, they’re bumping up the level of competition on every other DB and they’re also young kids. Young kids are special because young kids only know the way you want them to do it,” Chinander said. “Some of the older kids are set in their ways a little bit and it’s like trying to break a wild horse, these young guys want to do it how you want them to do it so if I tell them to run to the ball, they’re running to the ball full speed and it makes other people look bad on film. Taylor is doing it their way. It’s helping. Jackson calls him a baller. Bootle, a guy who in the spring coaches had to tell to stop hitting so hard, says Taylor is just like him.